When your computer is part of a Network, if you want to use files that are stored in shared folders on a networked computer, you need to access the Shared Folder by typing the Network Path (i.e. \\server\sharename) of a folder which you want to access. Since it would be used regularly in day to day life, it will be more difficult or boring to type Network Path on every time to access Shared Folder/Network Folder. Instead of doing this we can map a drive letter to that Network Folder to make it easier to access. 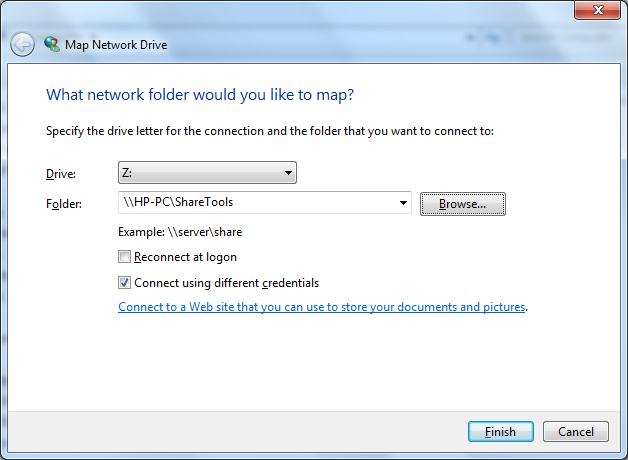 When you map a drive, Windows shows the Shared Folder as a Drive in the Network Location section of Windows Explorer. It will also appear in the Open dialog boxes of most programs (in the Computer section of the Navigation pane). 3. Select an unused drive letter for the shared folder in the Drivers list. 4.In the Folder text box, enter the network share path name or you can click the Browse button and locate the shared network folder.You can type the path like the \\DevServer\ShareTools. 5. Select the Reconnect at Logon check box if you want Windows to map this same drive every time you start the computer. 6.Also, if you're not an administrator, select the Connect Using Different Credentials check box. And click the Finish button, it will ask to enter username and password in the Windows Security dialog box and click OK to Finish. 7. Then you could see the Mapped Drive as shown in below. Note: This article is applies to Windows 7, Windows 8, Windows Server 2008, Windows Server 2008 R2, and Windows Server 2012.